Melasma Freckles is a common problem in which there is an increased production of brown pigment (melanin) that occurs in sun-exposed areas of the face. It affects mostly Child bearing women. are affected more then other races. 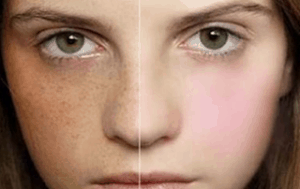 Melasma is more apparent during and after periods of sun exposure. However, it is lacking in winter months, when sun exposure is less. Melasma Freckles is often present on the cheeks, upper lips and forehead and sometimes it occurs on the forearms. It looks like brown patches of skin which at times can cover the entire face, thereby, giving a mask like appearance. Therefore, not only can this mask affect how others see a patient with Melasma, it can affect how patients with Melasma see the world. Likewise, anxiety and depression are more common in patients with Melasma. Medications or cosmetics and other factors. The majority of cases appear related to pregnancy or oral contraceptives. However, sun exposure does appear to be a stimulating factor in predisposed individuals. However, up to a third of the occurrences in women are not preceded by any specific condition. Melasma is very difficult to treat, and even harder to cure. It usually requires a combination of lasers, topical bleaching medicines, strict sun avoidance and daily sun block. When medicines such as birth control pill are the cause they generally have to be discontinued to see long term improvement. One may see their melasma clear with therapy, but flare during the summer months after sun exposure and this may require additional maintenance treatments. Using the Fraxel laser’s unique approach of using millions of microscopic thermal spots to gently resurface only portions of skin at a time. We now have the ability to penetrate deep enough into the skin to eliminate the skin cells that cause melasma while protecting the skin’s outer layer. FDA clearances for the Fraxel laser include skin resurfacing treatment of sun damaged skin, acne scars and melasma. For melasma, Fraxel laser treatments are performed after every 7-10 days for a month or two. Sun avoidance and the use of a high grade UVA and UVB sun block is essential at all times. The laser at a wavelength of 532 nm is used for tattoos, sun spots, nevus of ota, caf-au-lait, and melasma. The laser can penetrate and target melanin in the deep dermis, making it another option for the treatment of melasma. This procedure is provided in a series of monthly treatments . Sun avoidance and the use of a high grade UVA and UVB sun block is essential at all times . This laser is used to treat freckles and epidermal or superficial melasma. It causes small wounds on the area being treated. These areas start crusting after a few days and start regaining the normal skin color after 3-4 months. Treatment regimens include the use of a sunscreen with a minimum of SPF 40. Bleaching agents such as kojic acid, licorice extract, rucinol, vitamin c, anti-oxidants, retinoids. Such as Retin-A and a prescription product which combines a retinoid, bleaching agent and cortisone. Retinoids work by promoting the rapid loss of pigment by increasing skin turnover and easing penetration of bleaching ingredients into the skin. Commonly used alpha hydroxy acids (Peeling Agents) are Azelaic Acid, Mandelic Acid and Kojic acids. Due to potential side effects patients with darker skin types requires caution while using Glycolic acids. No matter what treatment regimen a patient follows, the use of a broad spectrum sun screen is mandatory. Unfortunately the only type of Melasma that may respond to topical therapies is mild, epidermal melasma, and this may take a minimum of 3- 6 months to work. The more common form of Melasma affects both the epidermis and dermis and for this variety, topical treatments are generally ineffective. To treat melasma Fractional laser and Q-switch laser including various other laser treatments are used. What happens to the skin after treatment? acids, glycolic acids, and astringents. You may clean the area using mild soap and water. You should avoid tanning and use a sunscreen on any treated areas exposed to the sun. Around 3-10 days after treatment, hair will begin to resurface. Mostly treated hair were “Falling out”. It is not regrowth. The hair follicles need to purge the hair that remain under the skin. Please refrain from waxing, plucking and bleaching between treatments (shaving is ok). Dose a long pulse Nd Yag work on all skin types? Nd Yag work on all skin types. However, Nd Yag laser is ideal for individual with darker or tanned skin rather then IPL device. We can provide effective results in fewer treatments more safely. It virtually eliminates or greatly lessened the risk of Superficial burns. Is permanent hair reduction possible for blonde or light hair? Because it contains very little pigment, blonde or light hair is difficult to treat effectively with any laser or IPL system. We can get some reduction, but it takes many treatments to achieve any meaningful results.